Aston Barclay Westbury has launched a new sales programme alongside modifications that will prepare the site for a future second auction hall. The modifications will prepare Aston Barclay’s Westbury site for a future second auction hall. 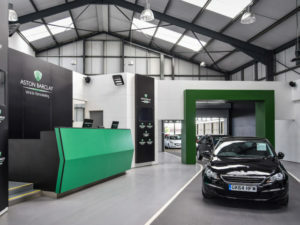 The new sales programme, which follows the signing of deals with Wessex Garages and MotoNovo, will see the site’s weekly fleet sale popular with Alphabet, Venson, Addison Lee and LeasePlan remain on a Tuesday, while the fortnightly light van sale moves to a Thursday and a monthly Mercedes-Benz sale will be held on the last Friday of each month. The site, which already spearheaded Aston Barclay’s introduction of an inspection imaging turntable and SpinCar technology, is also being modified under new plans to reposition the high-tech inspection bay to accommodate a second auction hall and cater for increased volumes in the future. “The £750k investment in refurbishing Westbury in 2016 helped fuel growth in the eight-acre site and we are now looking at further improving the site’s efficiency to cater for new vendors, building on the foundations of Westbury’s strong reputation for service and results,” explained Neil Hodson, Aston Barclay’s CEO.